Clifton R. Wharton, Jr., has combined careers in business, higher education, foreign economic development, and philanthropy. The son of Clifton Wharton, Sr. who served 40 years in the U. S. Foreign Service, Wharton began school in the Canary Islands while his father was a diplomat assigned there. He next attended the Boston Latin School in Massachusetts and at 16 entered Harvard University. He graduated with a Bachelor’s degree in history in 1947. Later that year he became the first black student to earn a M.A. degree in International Studies from Johns Hopkins University in Maryland. At Harvard, Wharton became the first black announcer at the campus radio station and first black secretary of the National Student Association, a lobbying group he founded. He was the first African-American accepted into the School of Advanced International Studies at Johns Hopkins University earning an MA in 1948. 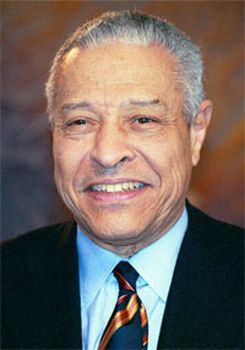 In 1969, he was appointed a director of the Equitable Life Assurance Society of the United States becoming the first black person to sit on the board of one of the ten largest U.S. corporations. Interested in international technical assistance and economic development, Wharton’s first job was as a research associate evaluating U. S. technical assistance in Latin America. He was a graduate student in Economics at the University of Chicago in Illinois at the time. In 1958 he became the first African American to receive a Ph.D. in Economics from that institution. In 1958, Wharton took his first full-time post, serving with the Agriculture Development Council (ADC) a non-governmental agency, which was concerned at that time with the population explosion threatening mass starvation in Asia. The ADC was formed in 1953 as a non-profit in the field of agrarian reform in Asia. Between 1958 and 1964 he directed Council programs in Malaysia, Vietnam, Thailand, and Cambodia. He rose to Executive Director in 1966 and Vice President in 1967. In 1970, Wharton was appointed President of Michigan State University (MSU). This was the first appointment of an African-American to head a major university. His appointment came during an era of often violent student protests against racism and war. When the U.S. military invaded Cambodia on April 30, 1970, expanding the Vietnam War, Wharton shared the frustration and anger of many of the MSU students. Addressing students protests in the wake of the invasion, Wharton differed from every other major university president when he offered to personally take student petitions against the war to Michigan’s congressional delegation in Washington, D.C.
Wharton remained at Michigan State University until 1978 when he was appointed Chancellor of the State University of New York’s (SUNY) 64 campuses. He held the position until 1987. Afterward, he briefly served as Chairman of the Rockefeller Foundation and later in 1987 was appointed President and CEO of the Teachers Insurance and Annuity Association and the College Retirement Equities Fund (TIAA-CREF), making him the first black CEO of a Fortune 500 Company. He remained in that position until 1993 when he became Deputy Secretary of State in the Administration of President Bill Clinton. Wharton has authored a book as well as numerous articles on topics such as agriculture, poverty, leadership, diplomacy, national security, and investing. He has also received a number of honorary doctorates. In 1994, he received the American Council on Education Distinguished Service Award for Lifetime Achievement. Wharton and wife Dolores, a retired corporate director and foundation executive, have been married since 1950. They raised two sons and reside in New York City. George R. Metcalf, Up From Within, (McGraw-Hill Book Company, 1971); http://americanassembly.org/people/trustee-emeritus/clifton-r-wharton-jr, accessed 2/12/12; https://www.csis.org/people/dolores-d-wharton, accessed 2/20/12. accessed 2/12/12; https://www.csis.org/people/dolores-d-wharton, accessed 2/20/12.